we have 11 days off in a row from Dec 22nd to January 2nd look forward to lots of reading, watching movies, catching up with friends, going to the beach and just letting this old year go! 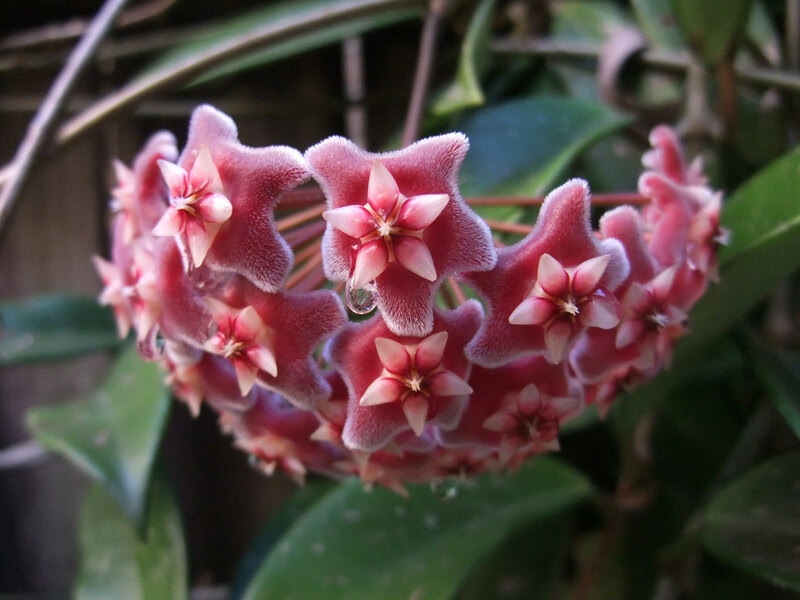 Gorgeous Hoya, Mo! I got all excited to see buds on our s, but, as usually happens, some little beastie has nibbled the stem! (((Di))) they are such tough plants but the flowers really don’t like to be touched by anyone or anything! Sounds good how you want to spend those days Mo, let it be a magical time for you both……………..
(((Martine))) we’re ready to let this year go! (((Liz))) y’know that amazing light out in the desert when the stars look so close you could almost touch them?! What an exotic furry flower and the gloves are looking amazing! Have a wonderful time taking a pause- like Fiona says! It’s 4AM now in Manhattan and having woken at 3 AGAIN, I’m catching up with favorite bloggers. 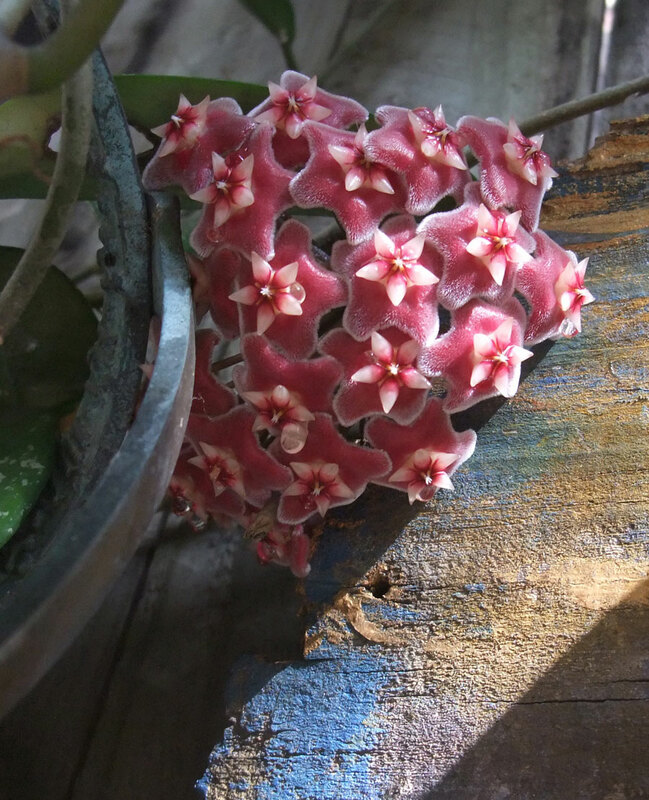 Your Hoya reminds me of Grace Forests Hoya and the woman who drove a long way to give it a home…and of the Hoya that blooms at my oldest Friends place in Massachussets, and has been blooming through moves to three different places for the last forty years! They are truly astounding plants. 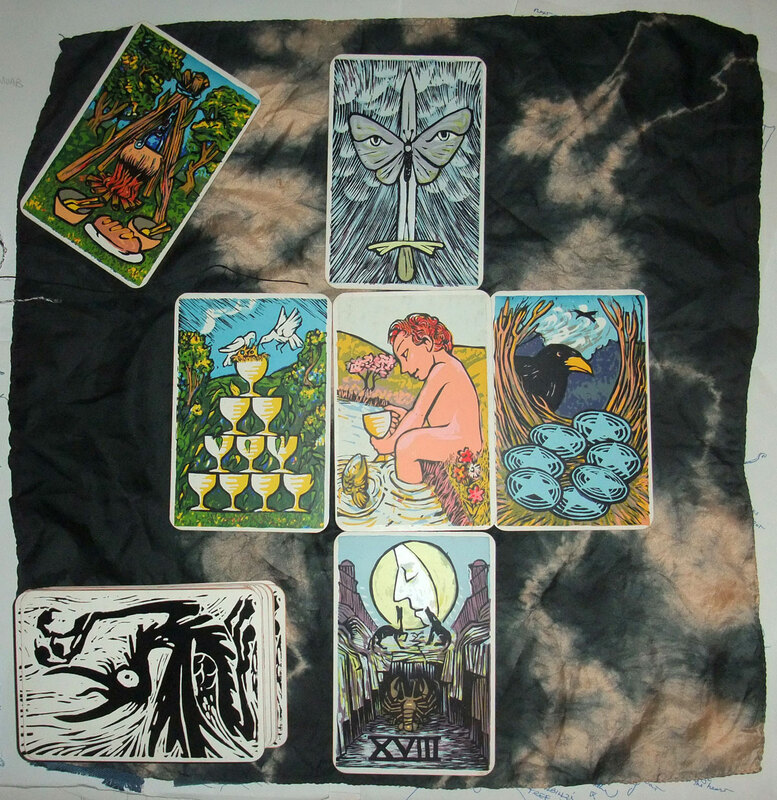 Love the stars that are keeping you ‘almost’ sane and blessings galore to you and the old man for your 11 days of freedom to be. (((Marg))) this is the longest time both Old Man Crow & I have ever lived anywhere in our whole lives, 9 years and there is 9 flowers this year, we love this old lady of a house so much, she has given us space to make lots of art and music and one of the really good things about getting old is the Gold Opal Card, we can go anywhere in the city on public transport for $2.50 return even the Manly Ferry & good to hear your card arrived safely! sounds like a good winding down of the year. 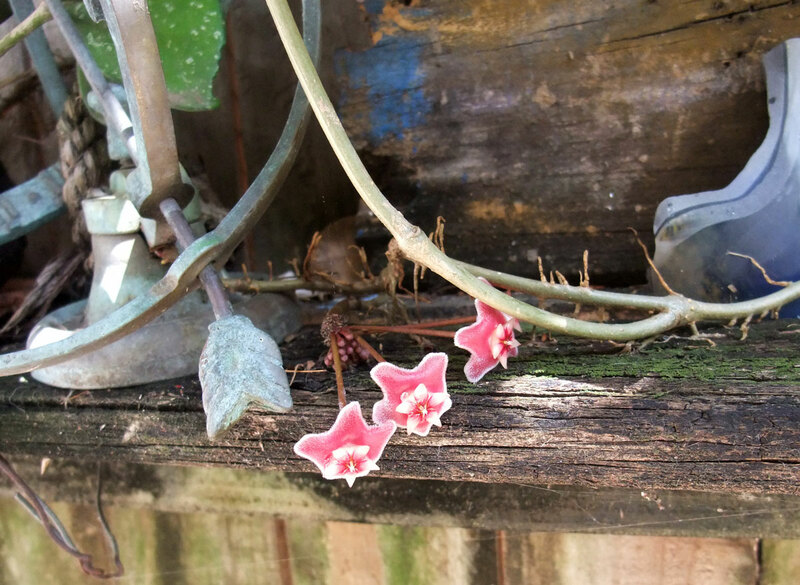 My hoya is also blooming (white with pink) here in southwest Florida. Thank you for the lovely card. May every kindness you share with the world find its way back to you. Happy Holidays. “Hoya” …sounds like some kind of word with deep meaning and purpose! And that glove…oh my! it does and the flowers are magical, they drip a subtly sweet nectar & flower in the same spot each year as well as making so many new ones this year! 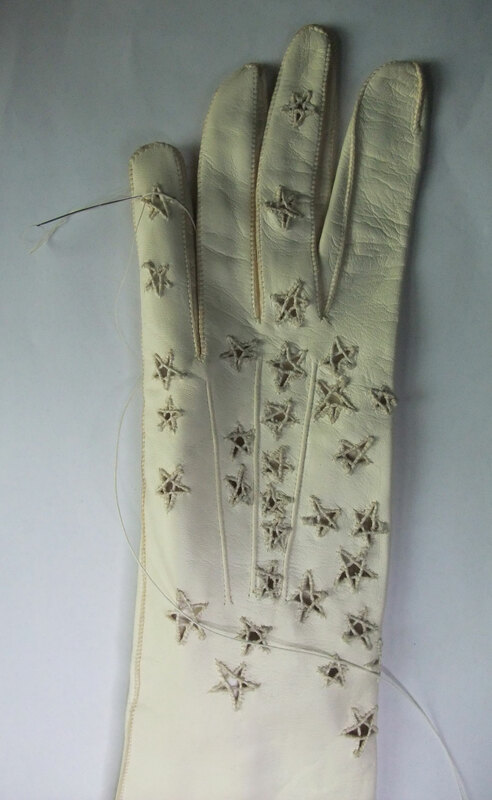 the gloves are ambitious, at the moment I am questioning my sanity! (((Nancy))) the Hoya has had even more flowers and the starry gloves are slowly coming along, stitched the best pentacle yet this morning just before work am loving this new year! !